"Those are the guys that did 'West End Girls' and that song about brains and money or whatever, right?" Invariably, that's the response I get from fellow Americans when trying to discuss Pet Shop Boys with them. And I'm tired of it. Sick and tired of it, folks. Don't get me wrong, I love "West End Girls" and "Opportunities (Let's Make Lots of Money)," but there is so. Much. More. I'm fanatical about Pet Shop Boys. I'm fanatical about them in the same way the Depeche Mode fans who commented on my recent Depeche Mode piece are. Although, I think I'm less angry? Then again, perhaps not. The conversation outlined above does make my blood boil and fill me with inexplicable rage. But I mean, I'm not so fanatical of a fan that I can't recognize when Pet Shop Boys put out a clunker; Bilingual, Nightlife, and Release weren't great. Rather spotty, if I'm being honest. In fact, some bits of that album run are downright silly. 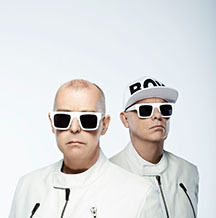 Guinness Book of World Records has named Pet Shop Boys the most successful duo in U.K. music history. According to Billboard, as of 2003, they were listed as the 4th (behind Madonna, Janet Jackson, and Donna Summer) most successful act on the U.S. Dance/Club charts. They've sold over 50 million albums worldwide, had 42 Top 30 singles, and 22 hits in the U.K. Top 10. They are three-time Brit Award winners and six-time Grammy nominees. We named last year's Electric as one of the 125 best albums of the year (just sayin'). Once again, we've dumped these tunes into a Spotify playlist for ya, too. B-side to "Always On My Mind"
B-side to "Did You See Me Coming?" kenny…wow!! !...thanks so,so,so, much for the PSB plug,ie; info for people who tend to forget bands not in ‘‘now’’ spotlight..i’ve seen all last 6-8 tours..did the ‘‘meet n’ greet’’ get stuff signed,shake hands,chat! !..great shows..never the same..never! !..and yes i still trully believe have something to say..and if ya listen to ‘‘electric’..say in ‘‘now’’ style! !..thanks again..music fan u.t.r. mag subscriber!! Brilliant list. This is the best way to procrastinate on the internet. Nice post!! Thanks a lot for the kind of perfect topic I have not a lot of information about it but I have got an extra unique info in your unique post.!! Very interesting topic will bookmark your site to check if you write more about in the future..!! @Troy Processor- God. HOW KILLER IS “I WANT A DOG”?!? RIP, Frankie Knuckles. Really nice information. hanks a lot for the kind of perfect topic I have not a lot of information about it but I have got an extra unique info in your unique post.!! I think all the 10 songs shared here are very thrilling because my friend has told me about this song that’s why I think they are very interesting to hear. I want these songs, so update the link of the songs here now if possible. Really interesting article you have shared thanks for sharing and do not forget to visit the site couponseye.com where you can get the latest discount offers. That is a good top! You are from the US right ? Remarkable post regardless I was reasoning about whether you could make a litte considerably all the more in regards to this issue? I’d be uncommonly thankful in case you could widen truly further. Respect it!